Kids in the Garden is an easy and fun guide for children to use on their own or with adults, and encourages children to learn about gardening, healthy eating and caring for the environment. With easy to follow step-by-step instructions, with bright photography and fun illustrations. The book is aimed at children aged five upwards with adult supervision, then for older children up to 11 to complete on their own. The book features more than 50 projects, with full instructions on the materials needed, companion plants, saving resources, harvesting seasons, seeds, the water cycle and indoor gardens. There is also a section on wildlife, showing how to encourage animals into your garden, as well as how to make a mini pond, birdhouses, pest patrol, building a wormery, rescuing bees and ladybirds, and much more. The plants and vegetables featured include potatoes, tomatoes, pumpkins, peppers, herbs, strawberries, blueberries, sunflowers and many more. The recipes included are simple to make with the fresh produce and include; one pot jam, minty fizz and easy pizza sauce. Elizabeth McCorquodale wrote for "Growing Stuff: An Alternative Guide to Gardening." Elizabeth studied Amenity Horticulture and Landscape Design at Algonquin College in Ottawa. After returning to the UK, she spent three years working in a Garden Center before becoming a freelance garden adviser and designer. 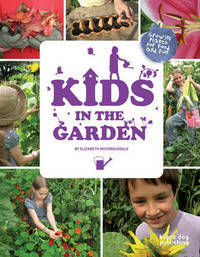 She has also worked at a local school, helping children to learn about plants and growing things in the garden.